Denny Johnstone has scored two goals in six games for the Scotland Under-19 side. 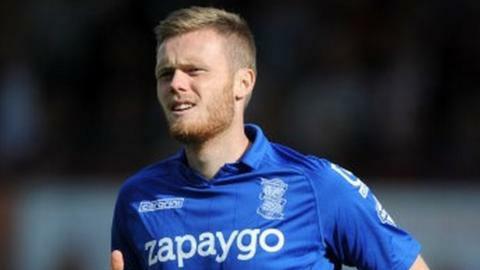 Macclesfield Town have signed teenage Birmingham City striker Denny Johnstone on a one-month youth loan. Johnstone, 19, who joined Blues from Celtic this summer on a three-year deal, is scheduled to stay at the Moss Rose until 24 December. The Scotland Under-19 international's only two Blues appearances both came as a late substitute in August. Johnstone, who has won six caps for Scotland's Under-19 side, came through the academy system at Parkhead and was a regular in Celtic's Uefa Youth League side last season. Macclesfield currently lie in third place in the Conference table, seven points behind leaders Barnet. But the Silkmen are due to travel to Barnet on Saturday, when Johnstone is expected to make his debut.